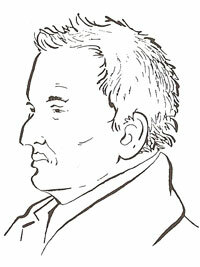 David Douglas' chief claim to fame stems from his travels and explorations throughout the U.S. in search of animal and plant specimens hitherto unknown. His name is immortalized in the spruce he discovered, named Douglas Fir. The primrose genus Douglasia is also named for him. ■ Douglas was born in 1798 in Scone, Perthshire, Scotland. He was the son of a stonemason and was apprenticed to the gardens of Lord Mansfield. From there he went to the Botanical Gardens in Glasgow. While still a young man he was sent to the United States to collect plant specimens for the Royal Horticultural Society. In 1830-34, he traveled to the Oregon Territory and down through California. He also traveled through British Columbia and east to Hudson Bay in Canada. It was during his travels through the American West that he found the Douglas Fir. ■ When Douglas traveled across the American West, it was still as wild and primitive as when Lewis and Clark made the first overland crossing to the Pacific Ocean 25 years earlier. ■ It is estimated that as a result of his exploration in the United States and Canada nearly 50 trees and shrubs and 100 herbaceous plants that had never before grown there were introduced and grown in the British Isles. Widely acclaimed for his work, he was honored by the Linnean, Geological, and Zoological Societies and the United Kingdom. ■ Unfortunately, when only 36, Douglas was gored to death by a wild bull in the Sandwich Islands (Hawaii) while he was collecting specimens. The date was July 12, 1834. ■ A monument in his memory was erected in the churchyard at New Scone, Scotland. It was paid for by donations from fellow botanists.